Do You Audit The User Experience of Your Channel Partner Program? You should manage the partner experience of your website or partner portal, just like you manage the customer experience of your company website. It's not uncommon for vendors to focus on how much material they can put out on a partner portal versus how easy it is to use. The process of auditing the partner experience or usability can be very simple and help to improve the quality of your channel partner program. Try creating a dummy partner account and have someone that is unfamiliar with your partner program and resources sign in and try to accomplish some standard tasks. This should not be limited to interacting with a partner portal; it should be task based and include non-portal based activities where appropriate. This is a very simple concept, but if you haven't tried it, you may be surprised how hard it is for your partners to navigate your channel program. So give it a try. I would be interested in hearing what you learn! Does your New Year's resolution include doing a better job of account planning with your channel partners? If not, it should. Partner Account Planning is a great way to improve channel performance, but is often taken for granted. With the beginning of a new year, there's no better time to improve your partner relationships than with a refreshed joint account plan to improve sales performance. So let's discuss how you can improve your channel partner account planning efforts. Why are Partner Account Plans so important? First off, it is unlikely that your partners will achieve the goals that you need to establish, without a clear and common view of what those goals should be. It is amazing how often companies fail to put at least a simple partner plan in place, to ensure that everyone is chasing the same objectives. Beyond common objectives, the likelihood that revenue goals will be met go up subastantially if both parties commit to a common plan and approach. 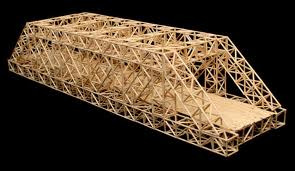 In addition, the act of building these plans creates a foundation of trust with your partners. This mutual trust is achieved through your joint accountability, knowledge, and collaboration. Listen to your partner's challenges and share your expertise in an open dialog. By collaborating and working within your partner's framework, they will view you and your organization as a reliable ally. You will be able to maximize their potential with custom made business plans and joint action plans. Everyone will be on the same page, setting up the perfect environment to bring success to both parties. What are the key elements to your Partner Account Plans? Depending on the size and nature of the relationship you can scale up or scale down requirements of the partner account planning process. If you click on the button below you will be able to download a simple partner account planning checklist, that goes a level deeper in outlining an account plan checklist. This will at least provide you the foundation to customize your own partner account planning template. What are the primary benefits to creating Partner Account Plans? Need help building the structured partner account planning process? We created the Partner Account Planning Checklist above for you to download. This checklist was designed to be a flexible guide, and provide you a resource to get started. We strongly encourage you to customize it for your needs and the needs of your partners. The key is not taking the Partner Account Planning process for granted this year. Get the year started on the right foot and kick off the development of the Account Planning process with your partners. If you're interested in discussing how to get started, please send a note to Steve Perry at slperry@pereion.com. Please subscribe to the Pereion blog below for additional topics on improving channel performance. Channel Capacity Planning is a key element of the Channel Readiness process to enable your partner channel to achieve its revenue objectives. The key is to start with a clear view of your business goals whether that is an overall profit goal, revenue target(s), or new customer creation. Next you should consider the role you need channel partners to play in achieving your overall business goals. If you have that clear view of revenue, profit, the number of transactions, the number of new customers; then you can build your channel capacity plan accordingly. The answer to what role(s) you need the partners to fulfill will shape the channel capacity planning exercise. Let's assume you to need the partner to create customer demand. You should have a view of how much total demand you need the partners to create relative to your overall marketing plan and whether they will need to generate all of their own pipeline. Then you can map back to the number of transactions you need each partner to close, and how many new qualified marketing and sales leads they will need to create. From lead creation per partner, you can start to project what marketing resources you will need for each partner to be successful; that could include comarketing dollars, collateral, markeng support staff, etc..
You can walk through a similar exercise as the marketing capacity planning depending on the role you need the partner to play. Let's look at Implementation Services as another example. If you are leveraging your partner network to provide implementation services to your clients, then you need to ensure they have the training and bandwidth or you will create a backlog in customer implementations and ultimately revenue growth. Again, if you know the average number of transactions you need each partner to close and implement, then you can determine how many trained implementation resources are required per partner. This will enable you to build the right training program. The bottom line is structured data driven channel capacity planning enables you to build the channel needed to grow your channnel sales and achieve your revenue goals. While the level of complexity needed can vary significantly depending on overall requirements, not taking the time to build out a channel capacity plan will likely result in gaps in your ability to achieve your channel revenue plan. Pereion Solutions can help with Channel Capacity Planning through a structured Channel Readiness Assessment process. How to Create a Differentiated Partner Value Proposition? Companies tend to spend a lot of effort to maximize the value they can provide to their respective clients, but the value they offer their channel partners is often an afterthought. Creating partner value within your distribution chain is critical to having a successful indirect sales channel. Channel savy companies find ways to differentiate from their competitors through their channel programs and offerings. Any partner recruitment effort will be dependent on establishing a well differentiated partner value proposition. 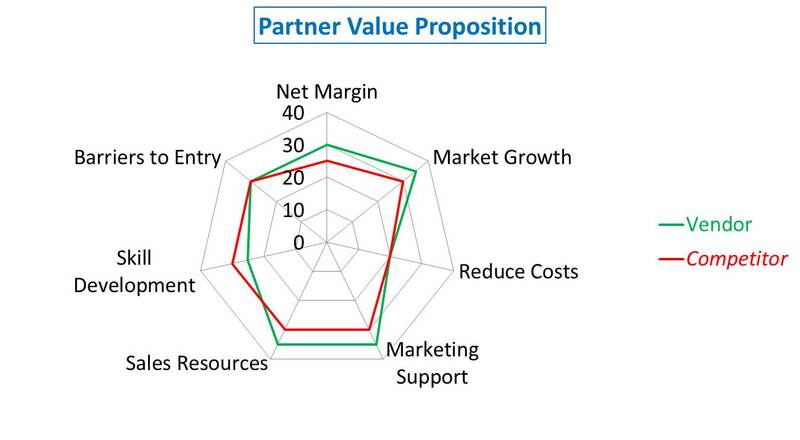 Assessing and defining the key elements of the partner value proposition is critical, a spider chart like the one that follows can help clarify the critical elements of that value proposition and where the key points of differentiation exist. Net Margin - Economics is the most critical element of your partner value proposition, while Net Margin is not the only element of the economic model it is an important one and an element that is usually apparent. That said you probably want to look at broader economic measures like partner ROI when you communicate the economic value of a channel partnership. Market Growth - Enabling your channel partners to identify and participate in key growth segments can be a huge value add to your channel partners who may not have the resources to identify and develop certain markets on their own. Reduce Costs - This comes in two flavors: cost reduction and cost avoidance. Value add services can reduce the cost for your partners, especially in areas like sales and marketing support. Cost avoidance comes in by minimizing administrative costs and reducing unnecessary investments that are critical to channel sales growth. Marketing Support - Marketing support sometimes gets minimized to marketing funding, while marketing funding is important there are other ways to differentiate partner offerings through marketing. Market intelligence, prospect lists, marketing content, social media support, and assistance in building marketing plans are all ways to provide incremental partner value. Sales Resources - There are various ways to deliver sales support to your channel partners, including sales collateral and tools, proposal support, and technical sales resources. Depending on your products and the channel sales model you can determine where you can provide the most value in enabling channel sales. Skill Development - Developing the marketing, sales, and technical skills within your partners is a critical element of any partner program; this is also an area where partners really look for assistance to grow their businesses. Barriers to Entry - This is an area that requires consideration and can cut both ways. What I mean by that is there are times you want to reduce barriers to entry and there are times when you want to preserve barriers to entry to protect profitability. Either way you need to consider the impacts. While this is certainly not intended to be an exhaustive list and there may be other areas you need to consider, hopefully it prompts your thought process as you think through your partner value proposition. It is critical to test your perceived value proposition with current partners and potential partners to validate both the elements of your value, your ability to deliver, and your relative position to your competition. Channel readiness is an approach to assess why your partner channel sales are performing at the current level and what the inhibitors may be to accelerate sales performance. While understanding all the elements that impact your channel sales performance can be difficult, having an approach to ensure the key elements are in place for your partner channel to perform is critical. Launching a new product, a new partner program, expanding to a new market, or assessing performance of your channel sales are all great opportunities to make sure everything is in place for your channel to deliver the sales results you need. 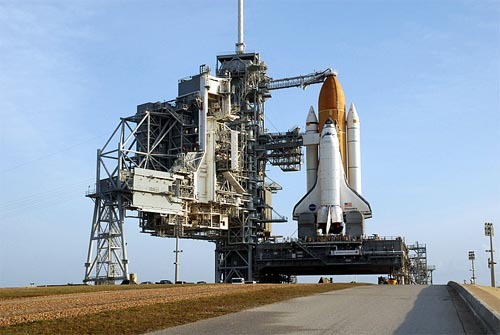 Think of channel readiness in terms of a launch pad. Is everything in place for your channel partners to be successful? Are you ready to launch that new product? Are you ready to enter that new market? Having a channel readiness checklist will at least ensure you are asking the right questions. Partner Profile - do you understand the profile of a successful channel partner? Channel Capacity - how many partners, how many salespeople, how many transactions are needed by region? Economic Model - does your channel program provide a profitable business model to your partners? Product Enablement/Access - do partners have access to the product and know how to use it? Skills & Education - are you providing the right level of training to your partners and do you know who is and is not trained? Sales Support - do you have the resources in place to support your partners throughout the entire sales cycle, including post sales? Marketing - do you have a channel marketing plan in place to deliver the lead volumes needed to achieve the sales targets? Order to Cash - is the infrastructure in place to register leads, place orders, ship products, and complete sales transactions? Partner Payment Systems - can you pay your partners in a timely and clear manner? Management System - do you have the data and tools to understand the performance of your channel and make decisions to improve results? This simple checklist gives you a starting point to assess the channel readiness of your partner program. If you have questions or would like to discuss how to apply a channel readiness methodology to your business, please let us know.